Love Ricky Gervais. 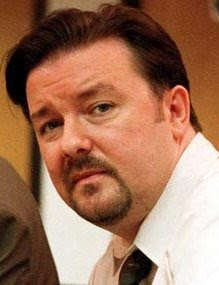 Discovered his podcasts and old XFM (London) radio shows, picked up the DVDs of The Office, which he co-created (with Stephen Merchant) and Extras, the finale of which was one of the darkest "comedies" ever shown on TV. Really wanted to see him on his American tour but no dates nearby. Also wanted the tour video, Fame, but it's not been released in the U.S. But I want it. Why can't I have it? It's a global market. This guy has been on Alias and The Simpsons, in A Night at the Museum and For Your Consideration, and has two or three other movies in (as they say) various stages of production. So I watched Fame last night and will have the live videos, Animals and Politics shortly. BitTorrent, but I would have gladly purchased them, as I did with everything else, even the podcasts through Audible.com. The world is flat? Piracy is killing your business?